The Different Flavors of Reality ~ Where Do Creative Ideas Come From? Writers use something everyone has but they use it more. I’m going to insert an image, but first want to credit the man from whom it was adapted, William S. Hatcher. I found the diagram in his book, Logic & Logos. I should mention, mostly because the image implies it, that the theories of Carl Jung support Hatcher’s ideas. 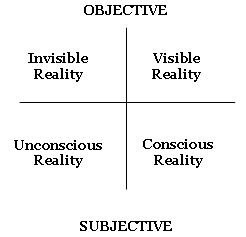 Unconscious Reality: Now we’re into the area of Reality that writers (and any creative person) use so much. This is internal to a person. Most people don’t pay conscious attention to this part of their mind. It makes itself known, whether a person wishes it or not, in dreams, day-dreams, sudden speech we often wish hadn’t left our mouths, and other interesting manifestations. Writers (and other creative types) take advantage of their Unconscious Reality. It either flows up to the conscious mind without bidding and is accepted as a resource for creativity or they work to make it manifest its images and energies.